Donald Bsitri has gained valuable and diverse experience at the Advanced Structures and Composites Center. With all of the different projects occurring at the Advanced Structures and Composites Center, the lab’s student research assistants and staff become critical in the completion of many of the projects. Donald Bistri, a sophomore Mechanical Engineering student from Tirana, Albania, works as an undergraduate lab assistant at the UMaine Composites Center. Growing up in Albania, Bistri wanted to receive a US education that provided hands-on experience in his field. “The opportunity to receive a US education, especially when coming from a third world country, is not a small thing. It’s one of those things you consider as a huge achievement on one side, but also as a huge responsibility on the other,” Bistri said. It is a responsibility Bistri has willingly taken on. Bistri came to UMaine with a strong academic focus, maintaining a high GPA while trying to gain real world, hands-on experience in engineering. “I started looking for hands-on jobs my freshman year and I submitted my resume to the center a couple of times. I was working in another lab and didn’t find it challenging, so I ended up applying for a front office job at the center,” Bistri said. While in the process of applying for the front office position, he was notified of an opening for a student lab assistant position, a position which Bistri gladly accepted. As a lab assistant, Bistri works to keep lab equipment calibrated and properly maintained for each project, and often helps out with specific project work. Through this process, Bistri has gained experience on many projects. His first project was working on MATLAB code for the NASA HIAD project. He also has training on many of the tools that are frequently used in engineering labs, including the crane, water jet, aerial lift, and forklift. Knowledge of these tools allows Bistri to effectively help others with their projects. Currently, Bistri and a small team are working to install the beachhead in the wave tank in the center’s new W2 facility. Aside from the technical side of engineering, Bistri says his center experience has helped him in other ways. “Working in this lab is another level of hands-on experience because you’re given real responsibility and there are so many moving parts. Even if you are doing the same thing every day, there is always something new in every project you engage in…there is always more to learn,” Bistri said. 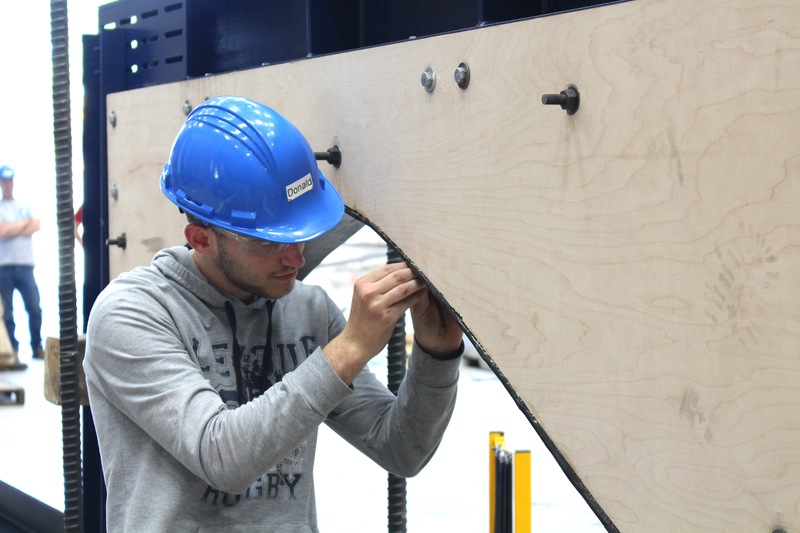 Bistri assembles a testing platform for a wind blade in the Offshore Wind Lab. A lot of that new learning comes from working with a team, according to Bistri. After working with so many different teams, Bistri has also come to realize the importance of effective communication skills in the engineering field. Bistri will try to leverage his diversity of knowledge gained at the center to graduate in 2017 with his BS in Mechanical Engineering with hopes to then pursue a Master’s Degree in Aeronautical Engineering, a degree not offered at UMaine, from the Massachusetts Institute of Technology. As for that future, Bistri would like to explore the many options that Aeronautical Engineering provides, and would be interested in working for NASA or companies like Boeing and Sikorsky. Bistri has two more years to build his already impressive resume at the center, and will look to gain more technical engineering experience before his undergraduate years draw to a close.